This page will detail how to add family history data to a patient's chart. 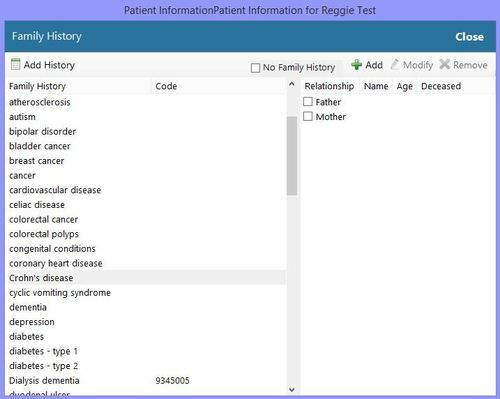 It will also explain how to customize the family history screen to fit each individual patient. Family History is structured data that must be recorded on the patient's electronic chart. This information is an optional requirement in Stage 2 of Meaningful Use. To document and view family history on a patient's chart, click the Family Hx button on the bottom left-hand portion of the patient's electronic chart. This will open the family history window. Clicking the Family Hx icon on the patient's chart will open the Patient Information: Family History pop up window, see image. To document a particular history item for this patient, select the history from the Family History column (for example, Acne) then check the box next to the corresponding family member. On default, TRAKnet will have a field for mother and a field for father; however, these fields can be added to as needed, going so far as to allow the user to enter family members by specific name and relationship to this patient. Once you have finished document a patient's family history, click Close to close this window. Adding additional Family History values, such as additional disease or condition history. 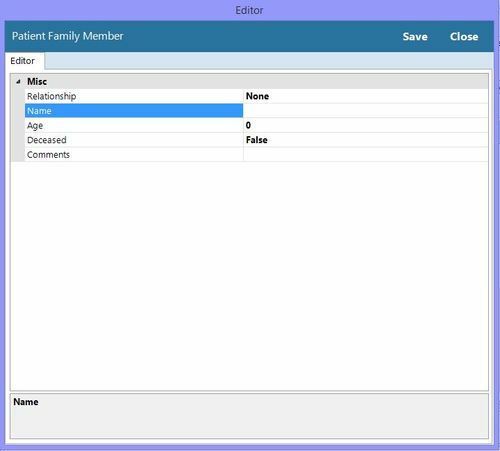 Adding specific family members, such as a sister, brother, or grandparent. To add a new Family History value, click the "Add History" button in the upper left-hand corner of the Family History window. 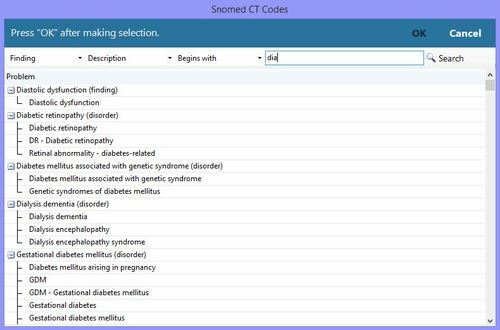 This will open the SnoMED CT search window, where you may search by a specific description for a history value and its associated SnoMED code. For example, entering in "dia" for "diabetes" will open a list of available history values meeting this criteria. To choose a history value, select the item from this list, then click "OK." This value will be added to the available Family History values in alphabetical order. To save this family member record, click Save. Please note that this is patient specific and must be done on a per patient level. While this is no longer a requirement in Meaningful Use in 2015, the below videos are left archived as a demonstration for documenting patient's family . For the most up to date video on Meaningful Use, please click here.